Heat oven to 350°F. Spray 13x9-inch (3-quart) glass baking dish with cooking spray. Cook and drain macaroni as directed on package, using minimum cook time. Meanwhile, in 3-quart saucepan, melt 1/4 cup butter over medium-high heat. Cook garlic in butter, stirring frequently, until golden. Reduce heat to medium. Stir in flour, salt, mustard and red pepper. Cook and stir until mixture is smooth and bubbly. Gradually add milk, stirring constantly, until mixture boils and thickens, about 5 minutes. Gently stir in ham, tomatoes and cooked macaroni. Remove from heat; stir in cheese until melted. Spoon into baking dish. 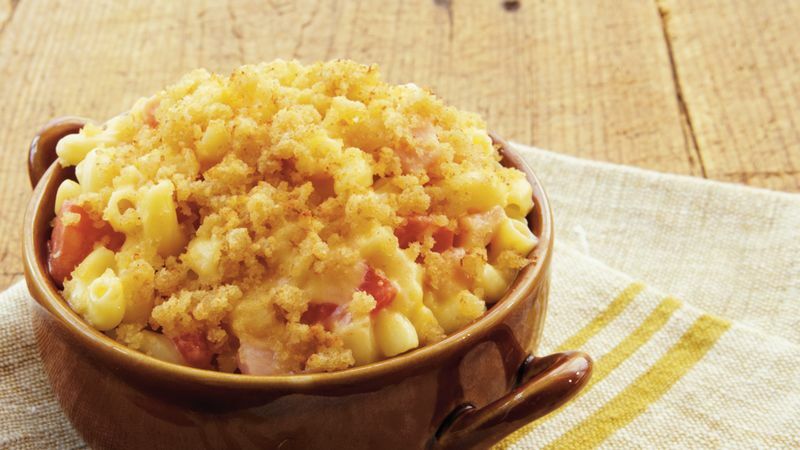 In small bowl, mix bread crumbs and melted butter; sprinkle over macaroni. Bake uncovered 20 minutes or until browned and bubbly.